Picnic shelter reservations can be made Monday through Friday, 7:00 a.m. to 4:00 p.m., by calling 760-839-4045. Walk-in reservations can be made at the Concession Building at Dixon Lake, 1700 La Honda Drive, Escondido. 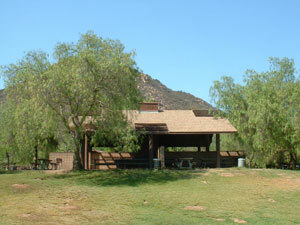 Additionally, you can make picnic shelter reservations on line by going to www.sunrisereservations.com and entering Dixon Lake in the search field. Picnic reservations can be made up to 90 days in advance. Please note that jumpers are allowed only in certain areas of the park, and a jumper permit must be obtained prior to your event. You cannot obtain a jumper permit on line; you must call the Reservation Line at (760) 839-4045 for the permit. Please call at least 2 weeks in advance for jumper permits, as your vendor must meet minimum insurance and licensing requirements and be from our list of approved and licensed vendors. ALCOHOLIC BEVERAGES AND GLASS CONTAINERS ARE NOT ALLOWED. Reservations will only be accepted with payment of all use fees and reservation fee. The parking fee at Dixon Lake is $5.00 per vehicle per day on weekends, holidays and special events, including trout derbies. CASH ONLY, PLEASE. All dogs must be maintained on a leash of no more than 6’ at all times. The leash must be held or controlled by the person handling the dog. Dogs are not allowed within 50’ of the shoreline, nor are they allowed in any boats on the lake. Service animals are exempt from this requirement. Dogs shall not be left unattended in any camper, motorhome, tent, vehicle or other camping equipment at any time. Animals in distress will be released from unattended vehicles by the appropriate enforcement agency. Dogs are not to be tied to any trees, shrubs, posts, fences or other items at any time. Owners of dogs displaying aggressive behavior, whether in the campground or day use areas, will be asked to leave the park with their dog(s). No more than three dogs will be allowed in any campsite at any time. Visitors to campsites must register any dogs at the concession stand prior to visiting any campsite. Visiting dogs are counted in the total number of dogs on the site.